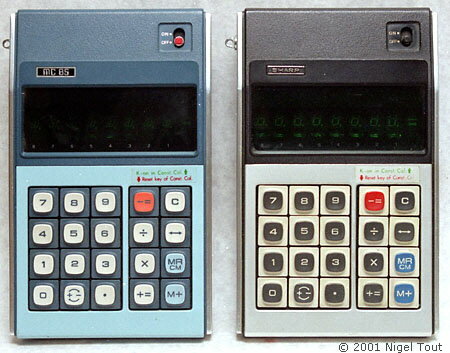 The Sharp EL-811, Prinztronic MC85, and Prinztronic MC95 are all similar, early hand-held calculators made by Sharp, though they have some significant differences. The batteries are sealed in the black pack at the top. Two main integrated circuits are used. 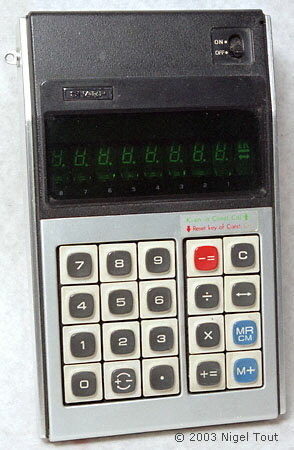 Distinctive features: One of the first hand-held, battery powered calculators with memory function. 7.2 v (6x AA) rechargeable battery. Display is 8 digits, green fluorescent tubes - the example in the photograph above has normally shaped digits whereas the example below has the more stylish digits of the Prinztronic MC85further down the page. Multiplications and divisions are performed to 16 digits - the lower 8 digits are shown by pressing the <-> key. 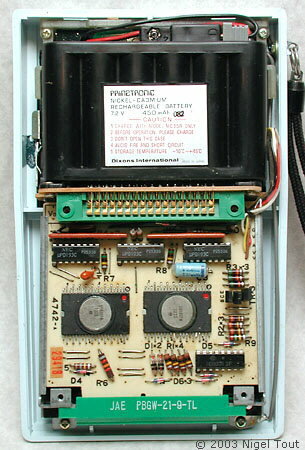 In the example above: Rockwell 10580CP (7223) & 10631PA (7225), here date coded to mid-1972. In the example with stylised display: Sharp 10572SA (2B047) & 10573SA (2B011), here date coded to mid-1972. 115 mm x 172 mm x 43 mm (4.5" x 6.75" x 1.7"). 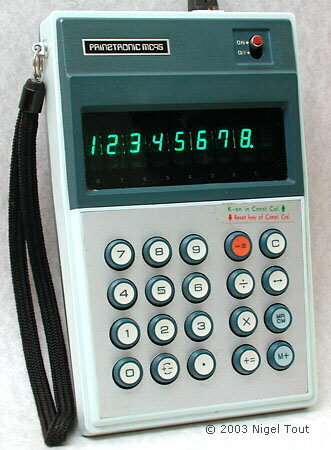 The Sharp EL-811 is the second hand-held calculator model made by Sharp, after the EL-8, and shows the steady advance in the development of the integrated circuits since this model only uses two, and also has memory, against the four ICs of the EL-8. Sharp had an agreement with Rockwell for the development of the calculator integrated circuits and the transfer of the technology. Dmitri Faguet has kindly provided photographs of an EL-811 with stylised display digits. 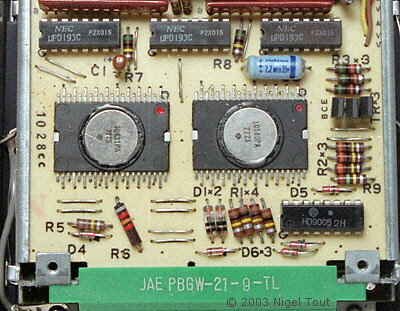 Circuit board of the example with normally-shaped digits showing Rockwell integrated circuits. 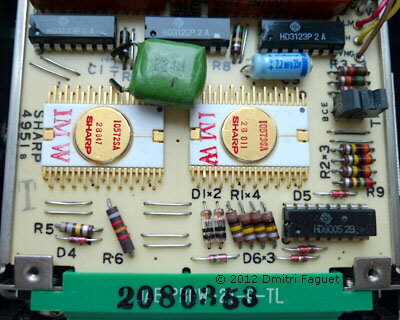 Circuit board of the example with styliseddigits showing Sharp integrated circuits. Prinztronic was a trade name of Dixons, a British photographic and electronic chain store company, now merged into DSG. The history section of the DSG international website says "[The company] forged vital links with Japanese manufacturers who supplied Dixons directly with products often made to the company's own specification and sold under the brand name of "Prinz". Hard bargaining and bulk buying, predominantly in Japan, gave Dixons the competitive edge over its rivals". Display is 8 digits, green fluorescent tubes - note the unusual shapes of the digits, characteristic of the displays of some Sharp calculators of this period, and the half-height zero. 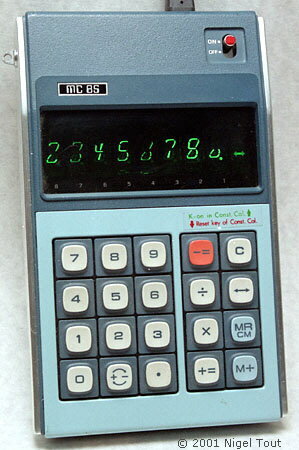 The calculator above is displaying 23456780. Main Integrated Circuits - Rockwell 10572PA and Sharp 10573SA, here date coded early 1972. The operating manual gives a clock frequency of 125 KHz. Made in Japan for Dixons International of Great Britain. 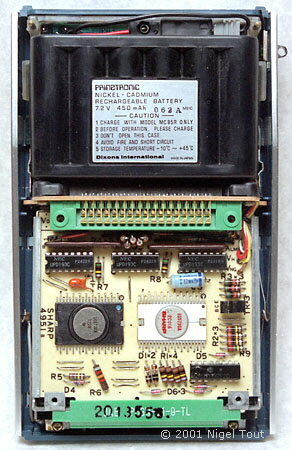 Apart from the colour and the badging, the case of the Prinztronic MC85 is identical to the Sharp EL-811, see below, though the integrated circuits are different. 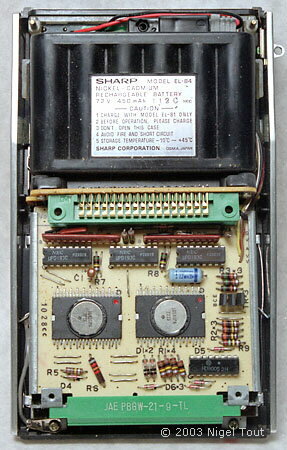 Sharp had arrangements with Rockwell for the development of calculator integrated circuits, that Sharp would than manufacture. This calculator has two ICs in the same number series, one made by Rockwell and one made by Sharp. The Prinztronic MC85 alongside a Sharp EL-811, showing that they are identical apart from colour and badging. Display is 8 digits, green fluorescent tubes - this has the normally shaped digits of the Sharp EL-811, not the more stylish digits of the Prinztronic MC85, above. Main Integrated Circuits - Rockwell 10580PA and 10631PA, here date coded to mid 1972. Price in early 1973 was £95 Sterling (about US$230). Although the case of the Prinztronic MC95 is slightly different to the Sharp EL-811, having more stylish buttons, the integrated circuits are identical.